Hello my sewing friends (and non-sewing friends too)! I can't believe how fast time is flying. It's the end of March already? What?!? Nothing like some jet-lag and facing reality to make you procrastinate about blogging. I am happy to report that I am feeling much more like myself again, and am ready to get back on the blogging wagon. With that, I have a couple more summery makes left over from my Maui wardrobe to share with you. When I tried on my Marianne dresses and discovered how nicely they fit, I decided to make a few t-shirts too. I just cut the pattern off at the lengthen/shorten line and used the skirt hem to shape the t-shirt hem. It worked out really nicely. And made for a super quick sew! For two of them, (the navy one and the mint one) I added cuffs to the sleeves. I'm not sure if I love how it looks but, I don't mind it, and it looks much better in the drapier knit than in the more stable one. This first Marianne Tee is made with some slubby jersey I bought ages ago from Wanderlust Fabrics. It's soft and light, and perfect for a summery tee. I find it kind of funny that I've been drawn to mint lately without even knowing it (the pug dress, one of my Marianne dresses, and now this tee). I've paired these shirts with my go to shorts - the Juba Shorts by Imagine Gnats. For this little denim pair I added back pockets (I used the pattern piece from Grainline's Maritime shorts) and I just rolled them up for a cute cuff. Sorry about the wrinkles, these pictures were taken on the walk home from lunch so I had been sitting in them all day. Next up, this pair of Juba shorts I made up in a quilting cotton from my stash, which also got the added back pockets (in fact they all did). 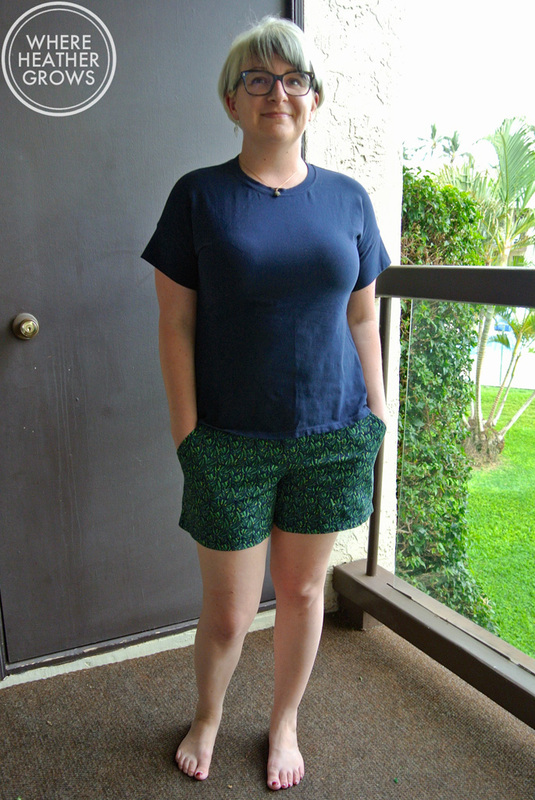 The Juba shorts pattern fits me so well right out of the "envelope" and I have found it looks really different depending of what fabric you pair it with. It's a really great pattern, and there's a Men's version included too! I didn't get any close-ups of the waistband, but the Juba shorts have an elasticized back waistband combined with a flat, drawstring front waist band. Super comfy! On all three pairs I used some twill tape for the drawstring as it hides nicely under a t-shirt and doesn't add bulk. Again, I apologize for the wrinkles, but come on, I was on vacation. I didn't want to iron! This navy Marianne Tee is made out of a cotton spandex jersey from Girl Charlee, and I actually think it is a bit too heavy for what I was after with summery t-shirt. Although I do like that it has a slight peplum look to it (which I seem to be hiding with my arms in all of the pictures). This last pair of Juba shorts are a little bit dressier in a stretch cotton sateen I picked up in the clearance section of my local Fabricland. It has a really nice weight and I love the colours. I had originally bought it with a pencil skirt in mind, but I think it works really well with these shorts. I didn't add the cuffs to this one, and I really didn't miss them. It's made out of a nice floral cotton knit I also bought from Girl Charlee. For a t-shirt, I know some of you might think the neckline on the Marianne is a bit high. But for a pale skinned Canadian girl like myself, it was actually really nice. I have burned my chest so many times, because I forget to put sunscreen on it, and for the most part, it doesn't get much sun which makes it extra sensitive. It was nice to have these tees in rotation on our trip to save my delicate skin. Actually, this last photo was taken on the day we left (hence the jeans) and you can tell I pretty much avoided any sunburn at all so - yay me! So there you have it, my complete travel wardrobe. It feels good to have this post done and out of the way. Now onto more sewing! Hope the weather is starting to warm up wherever you are; it's been gorgeous this week here in Calgary. What's the word hummingbird? John and I are in the glorious land of sunshine and pineapples - Maui! Actually it's been quite rainy and overcast since we got here, but it's still warm so it's all good. I have to apologize a bit for these photos. John took them twice (on two different days) and the lighting just didn't work out very well. It probably doesn't help that I'm as pale as a polar bear and matching the overcast sky. But anyway, it is what it is, and I really didn't want to try a third time (or ask John to take them a third time). Perhaps I am being to picky, but maybe not. Anyway, onto the dresses! This is Christine Hayne's latest release the Marianne Dress. I have to admit that when this pattern first came out, I wasn't too excited about it. I have a couple of knit dress patterns already, and I also thought I could probably achieve a similar effect with a lengthened t-shirt pattern. But then Christine did a round-up of dresses from her sew-along, and I kind of fell in love (I especially loved the red plaid one near the end). Plus I thought the short-sleeve (or rather no sleeve) version would be perfect for this trip. You're loving my model in the wind pose aren't you? Just wait, there are more to come LOL. Being the adventurous sewist that I am. I decided to jump right in and crank out three of these little babies in one night (while watching my new favourite show Nashville - have you seen it? S0 addictive!). I don't usually do that - I almost always make one version of a pattern first to check fit and what not, but I decided that knit dresses are pretty forgiving, and worst case scenario, I could just cut them all into t-shirts or skirts or something, if I didn't like the dress version. Luckily for me, I loved this dress right away (and for an added bonus, John liked it right of the bat too). It's a perfect, lightweight, easy to throw on dress for a warm vacation. Perfect on it's own with flip-flops, and also quite cute with leggings, boots and a jean jacket or sweater. This dress has such a nice and flattering shape. It's super simple, and I was quite surprised that it didn't look like a giant sack. Well it is a bit of a sack, but a sack with shape. I should also mention that the pdf file went together fast and painlessly, and GASP I cut it out instead of tracing like I usually do. That cut down the time considerably. Based on my measurements, I went with a size 10 at the shoulders and bust, and graded to a 12 at the waist and hip. I am really happy with the fit. And I'm really loving the neckline. I know it's a little high, but I like it combined with the kimono sleeves. I also shortened this dress by 2 inches at the lengthen shorten line, and I still had to hem another 2 inches off but that might have to do with the 4-way stretch of this fabric. This is a perfect shot of the wind hitting me. Look at that hair LOL. All 3 fabrics are rayon jersey knits from Girl Charlee. And actually the floral one and the gray and white one are from my January Knitfix pack (which was jammed with fabulous fabrics by the way. I think I may have mentioned it already, but I was really happy with what I got). The blue multi-patterned one I ordered at the same time, but it wasn't part of the Knitfix. I have kind of shied away from rayon knits in the past thinking that they would be clingy and hug all my lumps and bumps, but boy was I wrong! These three lovelies are super soft and have the nicest drape. I think they actually skim over my curves really nicely, and do the opposite of what I thought they would. I see more rayon knits in my future for sure! All three dresses were constructed with my serger and then hemmed with the coverstitch machine. I just turned the sleeves and hem under to finish, and then I also topstitched the neckline with the coverstitch too. This was such a super quick and easy project to make for my trip. These dresses are super easy to just toss on and I feel put together and comfortable. Not to mention that they seem to be allergic to wrinkling - perfect for packing. I've worn them all a bunch already, and I know I will continue to wear them when I get home. Do any of you have spring/summer on the brain yet? 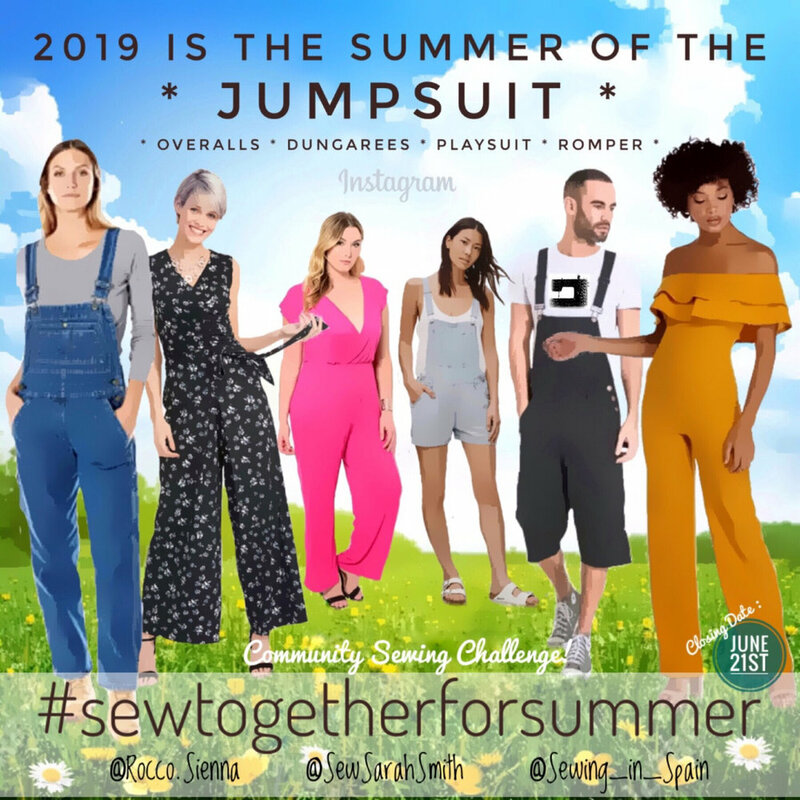 Have you started sewing for it yet? Also any foolproof and easy tips for getting good blog photos are welcome! I hope it's warming up wherever you are (it was actually +16˚C in Calgary yesterday - wowsers! ).